Mayor Lori Moseley was re-elected in Tuesday's election, and Wayne Messam won the election for the open Commission seat. Congratulations to both. No matter how you all voted, please get behind them and the other three Commissioners in helping make Miramar a wonderful place to live! Perhaps you've heard that there is an election around the corner. Well, you've heard right. On Tuesday, March 8, 2011, the City of Miramar will have its Municipal Election with the Mayor and One City Commission Seat on the ballot. The other Three City Commission Seats will be on the ballot in two more years. The Mayor and Four City Commissioners serve Four-Year Terms. My goal for this post is not to endorse any person for either role. This is not a political blog. I merely want you to have the information so that you are aware or have a place to start your own research before making well-thought-out decisions. I want what is best for My City! On the City Clerk's web page, you can find out many facts about the voting process for these offices as well as some information specific to this election. Precinct maps and financial disclosures and contribution reports are all there for those of you that really want to dig deep. And there is also contact information for each of the people on the ballot (I put it below as well). I encourage you to contact them to find out all you can! The following is a list of those who have qualified and filed the necessary papers for the March 8, 2011, City of Miramar Municipal Election. According to SunSentinel.com, these six candidates will speak to the public on February 24, 2011 at 7 p.m. at 6700 Miramar Parkway in the Miramar Multiservice Complex. Besides my commentary above, here are two other websites that I found that you wont see on the City's website. Again, I provide these to you to help you make up your own mind. In addition, I personally wrote an email to each of the six candidates last Thursday at the email addresses above asking for input about their biographies, projects and what goals they'd like to accomplish. So far, I haven't heard back from any of them. If I do, I'll add updates here. Sun Sentinel Endorsement of John Moore in a previous election for City Commissioner. There is some good information about Mr. Moore's background there. Yesterday, Mr. John Moore and Mr. Wayne Messam graciously replied to my emails. They provided good resources to find out more about themselves and their candidacies. You can get more information at www.waynemessam.com or call our Campaign Manager Latessa Hall at 954.558.3996. Miramar resident for 27 years. This is a link to SunSentinel.com Voter's Guide for the Commission Seat. You can choose two of the four candidates to compare head-to-head. Try it several times to find out about all possible match-ups. Last week, re-registration packets for the 2011-2012 school year were sent home to current Somerset Academy Miramar students. The one caveat was that at least 15 volunteer hours, which I believe is half, must have been completed before they will receive it. Along with the re-registration form, a letter from Principal Sadesky said that Sibling Registration forms would also be available online starting yesterday. When I didn't see the forms this morning, I called the school and asked them to put them there. Just a few hours later, you can find them if you need them. Nice! Current Student Re-Registration Packets are sent home with your child upon verification of volunteer hours. *= Please note that all current students, including 8th grade students, must have at least 15 volunteer hours completed prior to receiving any re-registration paperwork from the school or to receive report cards and/or transcripts necessary to matriculate to high school. If you have any questions regarding your child’s registration please email us at registration@somersetmiramar.com or call 305-829-2406 ext. 301. I previously did this short post with a few pictures if you're interested in hearing more about my opinion of the school. One last Pro Tip: call the number above if the email doesn't work. It bounced on me this morning. I did suggest they fix that issue, but a call will always be answered during office hours. 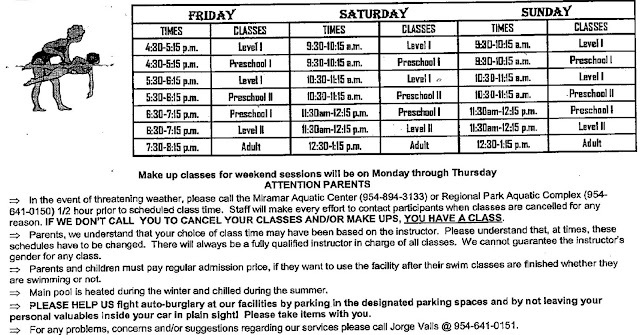 Well, I guess I dropped the ball the past few months keeping an updated Swimming Lesson Schedule for both the East Miramar Aquatic Complex and the Regional Park Aquatic Complex. Sorry. I called them up yesterday and predictably they told me they could not fax or email the current schedule to me, so I picked it up last night. 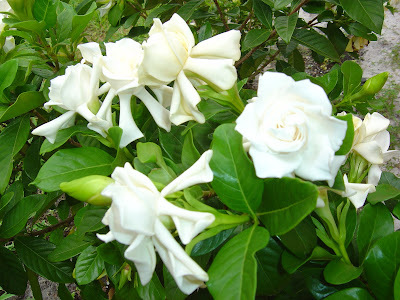 I hope this is helpful for you and will give you what you need through the beginning of May, 2011. If you are reading this and can't find the most recent schedule, leave me a comment or drop me an email and I'll get/post the newest one. 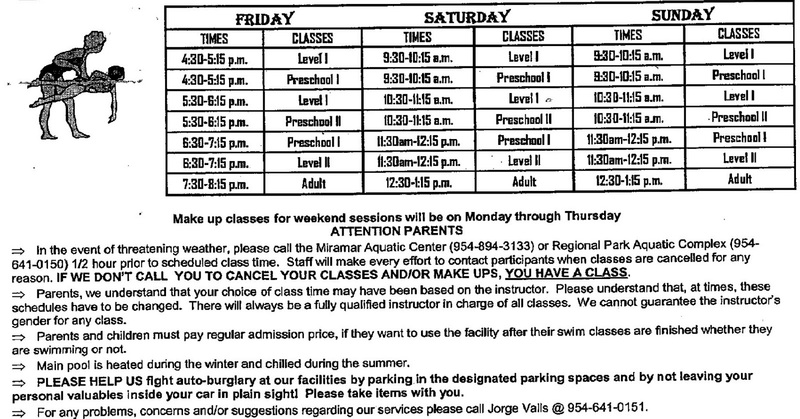 As a recap, my oldest son took lessons at the East Miramar Aquatic Complex located at 6920 SW 35th Street, Miramar, FL 33023 (954-894-3133). 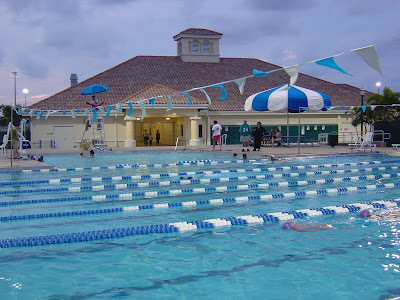 That was a while ago, but they have a large facility and my son picked up the basics and swims like a fish now. If you have more info or photos, please share them. Younger son took several swimming sessions at the Regional Park Aquatic Complex last year. That park is located at 16801 Miramar Parkway, Miramar, FL 33027 (954-641-0150). They helped him get over some of his fears, and he loves the pool and is eager to start swimming again shortly. You can see some photos of this park here. New photos and information are of course welcome as well. Remember to call ahead to make sure there are spots available in the class you are interested in joining. They do fill up.